Solve “The Mystery of Your Opponent’s Remaining Hit Points” without even having to equip the Sherlock Medic set! Picture by Gen. DeGroot. Most Medics I know run with the Ubersaw. That’s understandable, it’s a nice weapon. It looks good. It’s useful. It’s balanced. It’s fun to use. And if you see a dumb Spy or an AFK Sniper, you’ve just got yourself free Uber. The Ubersaw also has a fancy kill taunt. A while ago, it used to be silent, so you could hide around corners and catch people unaware with it, just like the Stab Stab Stab taunt. Some other Medics use the Amputator. 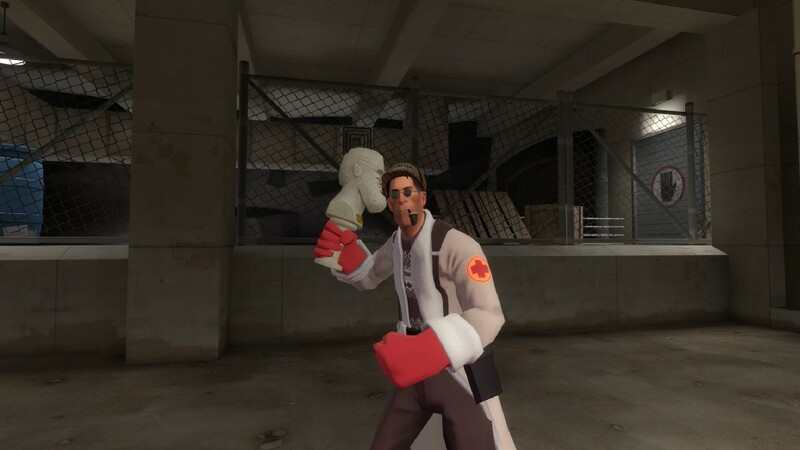 When the Medieval Medic set was around, it was a great weapon, but to be fair, no one really used it for the taunt heals. They just used it alongside the everglorious Crusader’s Crossbow to get that lovely regenerating health. These days, it’s about as useful as the Bone Saw. Lame Medics though use the Vita-Saw. Most Medics seem to agree that the Vita-Saw isn’t exactly balanced, since it rewards Medics who die a lot, and it messes with the eternal question of who has Uber advantage. And it’s got a silly downside. But me? I use the Solemn Vow. Why? Simple. I can see everyone’s health. You’d think that, at the low levels of skill that I’m often wallowing through, seeing health isn’t really that useful, since no one cares what health the enemy players have. But I care. I always care. You see, being able to glance at an enemy and see if they’re in the red or not means I can make a much more intelligent decision about whether to run or not! Of course, unlucky Medic that I am, this doesn’t always work and sometimes I get killed anyway, but that’s going to happen occasionally. No one has a 100% success rate. There are also more subtle uses with the Solemn Vow. Maybe your team is about to push, but you’re outnumbered? Check their health, you might be able to win! Or, if not, you can retreat and save that Uber of yours for when it’ll be more useful. How about sniping with it, using the Solemn Vow to fire well-placed syringes to catch people by surprise? You get what I mean. That’s not my most favourite reason though. There’s another, tiny bonus to be had with the Solemn Vow. Killing people with the Ubersaw looks cool. But the Solemn Vow? It’s not just cool, it’s also amusing. Let’s face it, a bit of irony is always funny.